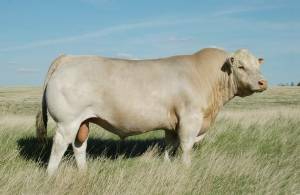 Ledger is anchored by two greaat cow families whose AICA Dams of Distinction solidify his breeding value. This docile bull may well be Bravo's replacement. Ledger was the record-selling bull at $105,000 in the 2011 LT Ranch Bull Sale.